Can acupuncture help your dog? Many medical and veterinary professionals used to dismiss acupuncture, calling it fake or useless. As alternative medicine gained popularity, more people began to notice that acupuncture was giving them good results. Doctors and health care professionals have begun to consider acupuncture as a treatment option for a variety of health issues. Veterinarians have noticed the effectiveness of acupuncture for years, but more and more are realizing its benefits. If your dog is suffering from a health issue that traditional medicine cannot help (or you want an alternative to medication or surgery) then acupuncture might be a good idea for your dog. Veterinary acupuncture involves the insertion of tiny needles into specific points on an animal's body. Acupuncture has been used for centuries to treat a number of conditions and promote general wellness for both humans and animals. Veterinary acupuncture is a part of Traditional Chinese Veterinary Medicine. According to TCVM, qi (life energy) travels through the body via channels known as meridians. Placement of acupuncture needles into specific points along the meridians can correct imbalances in the flow of qi. In some cases, electro-acupuncture is used (wires hooked up to the needles send tiny, painless electrical pulses to stimulate the points). Veterinarians who are trained and certified in TCVM learn which points and methods to use based on an animal's symptoms and physical exam. An acupuncture session may last about 15-30 minutes (could be more or less depending on the situation). Acupuncture may sound a little like "hocus-pocus" to some skeptics. Until recent years, the majority of Western medical professionals though so too. Now, evidence shows that acupuncture can benefit both animals and humans. Acupuncture is used to treat a number of conditions, including arthritis, spinal diseases, infections, epilepsy and more. If you think your dog may be a good candidate for acupuncture, ask your vet for information. You can most likely find a certified veterinary acupuncturist in your area and take your dog in for an exam and consultation. Although acupuncture does not work for all dogs and all issues, many owners report very obvious improvements with regular acupuncture sessions. Will Dogs Really Sit Still for Acupuncture? It may sound surprising, but most dogs do really well during their acupuncture sessions. In the beginning, some dogs are nervous and fidgety. However, they seem to learn quickly that there is nothing to fear. In fact, many dogs look forward to acupuncture because it makes them feel better! Of course, training and socializing your dog in advance is a great way to make sure the first few sessions go well. The first time your dog gets acupuncture therapy, the vet will start slowly to ease your dog into it. You may wish to bring some special treats for your dog to help make the experience positive. Many vets will have special treats in their office for this very reason. A favorite trick is to offer a small jar or dish of frozen baby food for your dog to enjoy. 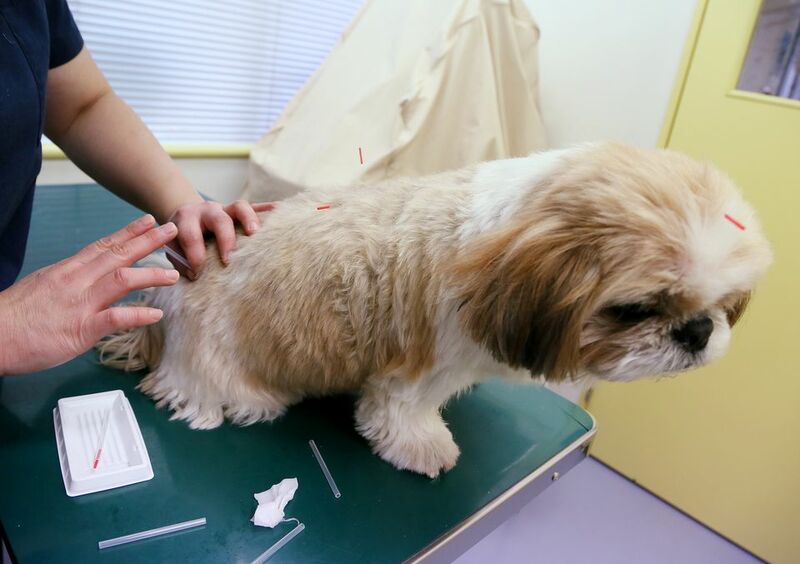 As your dog adjusts to the feeling of the tiny needles, your vet may add a few more. Every dog handles acupuncture differently, so remember to be patient with your dog and your vet.